Medical chemical storage laboratories by US Chemical Storage. Research and development organizations, medical device manufacturing, chemical engineering operations, and many other institutions use a wide variety of hazardous materials, including biological agents and reactive chemicals that can present dangers to personnel, the public and the environment. Proper storage and labeling of these hazardous materials is necessary to avoid hazardous accidents and alert emergency response personnel of incompatible materials that are being stored. Before storing hazardous materials in your medical chemical storage laboratory, it is necessary to understand proper storage practices. OSHA requires that a Materials Safety Data Sheet is locatable for every substance that is used in a medical chemical storage laboratory. Medical chemical storage must be maintained with temperature control settings and proper ventilation systems in order to keep inventory stable. Incompatible materials must be stored in separate rooms. If incompatible materials are mixed or stored nearby, hazardous situations are likely to happen. Make sure to organize hazardous substances safely and properly labeld with their hazard classification and chemical properties. Check with your local regulatory agencies for state and federal regulations regarding medical chemical storage and chemical waste storage in laboratories. US Chemical Storage designs custom-built modular laboratories to meet your exact specifications. These custom built laboratories are designed from heavy-gauge steel for superior strength and durability features. Customize your medical chemical storage laboratory with shelving, fume hoods, racks, eyewash stations, shower stalls, stainless steel sinks, alarms, gas sensors, liquid level detectors, mechanical ventilation, cooling systems, heating systems and more. Constructed by professional engineers and certified welders to ensure the highest quality laboratory. Meets EPA, OSHA, and NFPA regulations and FM or Warnock Hersey approvals. 4-hour fire-rated construction provides the ability to store your chemicals and work inside your laboratory safely. 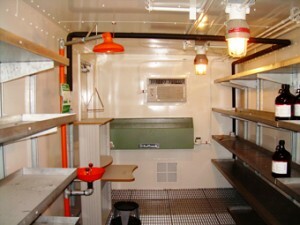 Modular chemical storage laboratories can be customized to store large volumes or smaller volumes of hazardous materials. These chemical storage laboratories can also be customized for mixing and dispensing hazmat, depending on your operations. Having the ability to store chemicals inside your laboratory while working inside your operational facility provides great advantages to increase operational production. Our 2-hour fire-rated construction is designed to compliantly store hazardous materials nearby your facility, at distances 10 feet to 30 feet. Store chemicals and hazardous materials closer to your facility, while increasing production operations with a FIREloc series chemical storage laboratory. Featured with a 15-year structural warranty and a leak-proof secondary sump containment. These laboratories meet EPA, OSHA, and NFPA regulations.